After being distracted by Drashigs and disappearing mathematicians, the Doctor, Ann and K-9 are back on the trail of the Sinestrans’ mysterious benefactors as The Syndicate Masterplan Volume 1 comes to a close. Landing on a desolate planet that is all-too-familiar, the TARDIS crew find themselves guests at a sinister health spa where some old enemies of the Doctor lie in wait. The story opens with the heroically named Mac Foley coming a cropper of some very hostile plant life and from there, we’re thrown into a pacey mystery involving sinister experiments, mistaken identities and references to some of the Doctor’s earliest adventures. 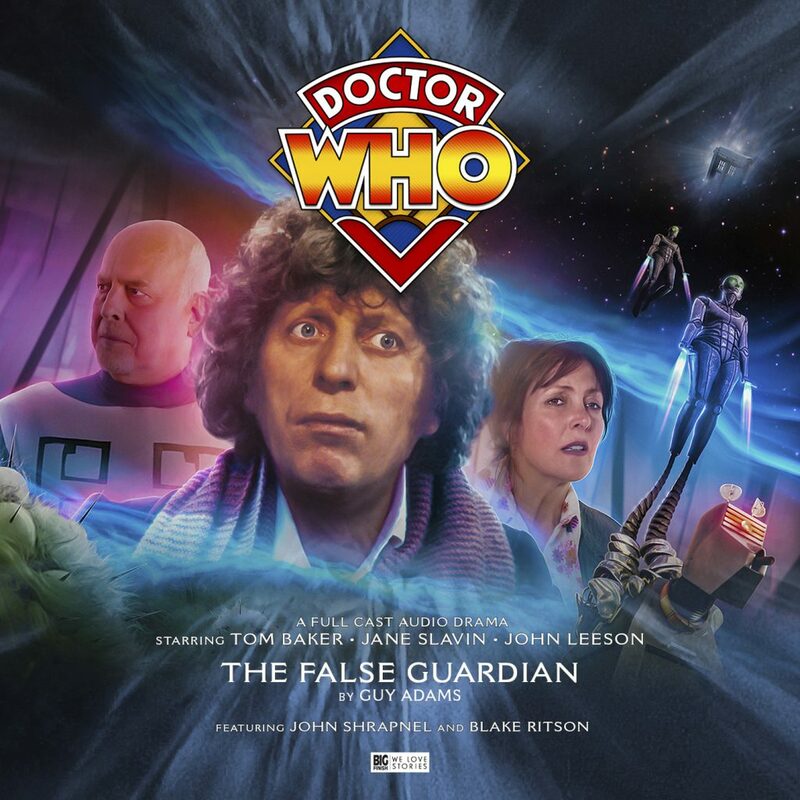 Guy Adams has achieved something remarkable with The False Guardian, combining the wit and whimsy of the late 1970’s with the Boy’s Own, science fiction of Terry Nation and David Whittaker’s 1960’s serials. For if it wasn’t made clear in Doctor Who Magazine, interviews and the boxed set’s title, this is a sequel to one of the Doctor’s earliest adventures, one that is largely missing from the archives. Whether this works for you as a listener depends on what it is you want from a Big Finish audio. If you want an authentic feeling 4th Doctor adventure, then you may find yourself chipping away at some of the cracks. After all, it’s unlikely that Graham Williams would have mounted a series long sequel to a story from over a decade ago that was, most likely, bundled into a skip and had never aired again. It wouldn’t even be novelised for over another decade. If you want your Big Finish audio to take beloved characters and put them in new situations, taking full advantage of the imaginative flair that the audio medium can provide, then this is probably for you. This is a Fourth Doctor story that could only really exist in an age where the minutiae of adventures from over 50 years ago are available to peruse in a variety of forms prior to, or following, the listening of this boxed set. It’s not an easy thing to pull off, and the second cliffhanger’s meticulously constructed tension is deflated somewhat when you have to do a quick TARDIS Wiki search afterwards to confirm what’s actually happening. That being said, Tom Baker and guest actor John Shrapnel are having such fun with the script that it’s hard to be too critical of the overall play. Adams’ script is brimming with ideas and energy, with some outright hilarious moments for the Doctor. His instruction to a masseuse to work around his clothes elicited a belly laugh from this particular commuter. Similarly, the Doctor and Nigel Colloon’s discussion about their fellow guests over a ginger beer is at once conspiratorial and convivial, the Doctor’s more relaxed good cop routine bearing fruit as we reach the story’s cliffhanger ending. Ann’s more dogged investigative routine bears fruit too, as she uncovers the more sinister side of what’s happening at the complex. Strange experiments conducted by the sinister Elmore, played with lip-smacking relish by Blake Ritson. Whilst both Doctor and companion’s investigations lead to an underwhelming climax, there’s definitely the sense that we’re at the tip of the iceberg where the overall arc is concerned. If the remaining stories build on this heady mixture of big concepts, space opera and sharp, witty dialogue then we’ll be in for a treat when The Syndicate Masterplan Volume 2 is released in February. Stars: Tom Baker (The Doctor), Jane Slavin (Ann Kelso), John Leeson (K-9) John Shrapnel(Nigel Colloon), Anna Acton (Brox), Blake Ritson (Elmore), Roger May(Mac Foley), Tracy Wiles (Drones). Other parts played by members of the cast.